by Dr. Toolika Gupta, former PhD student. Piqued by an interest in fashion history and encouraged by a paper presentation in Sept 2011 at the Fashion Colloquia London held at the London College of Fashion, a crazy pursuit of exploring British-India’s past in terms of dress led to the beginnings of this research. I started my PhD in October 2012 under the supervision of Frances Lennard and Ms Rebecca Quinton. After one year Rebecca had to leave and Dr Sumita Mukherjee was my new supervisor. I have really learnt a lot from the three of them. ‘The Influence of British Rule on Elite Indian Menswear: The birth of the Sherwani’ is a study of the influence of politics on fashion and the resulting development of new garments. This research was designed to demonstrate the effect on elite Indian menswear of the two centuries of British rule in India. It is an effort to understand how the flowing garments worn by elite Indian men in the 18th century gradually became more tailored and fitted with the passage of time. The study used multiple sources to bring to light lesser known facts about Indian menswear, the evolution of different garments and especially of the sherwani. The sherwani is a knee-length upper garment worn by South-Asian men, and is widely considered to be India’s traditional menswear. My study highlights the factors responsible for the birth of the sherwani and dispels the myth that it was a garment worn by the Mughals. Simultaneously, this study examines the concept and value of ‘tradition’ in cultures. 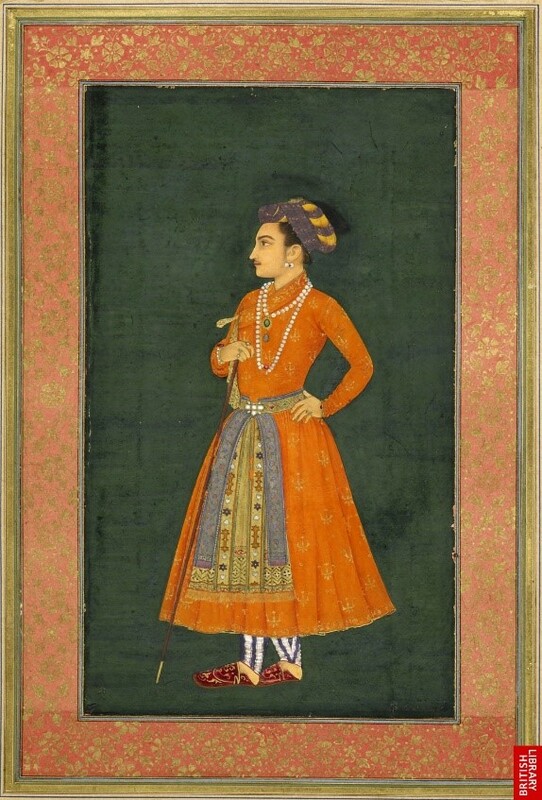 It scrutinises the reasons for the sherwani being labelled as a traditional Indian garment associated with the Mughal era, when in fact it was born towards the end of the 19th century. 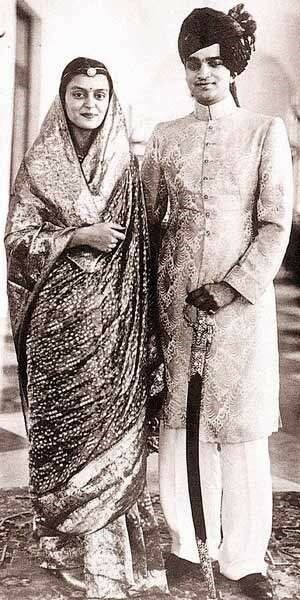 The study also analyses the role of the sherwani as a garment of distinction in pre- and post -independence India. I set out to discover how Indian menswear changed as a result of British rule. To begin with I started reading about the history of the time period 17th to 20th century India, Mughal and British India and the transformation. The next target was to read about the dress worn by Indians and the British who came to India at that time. The literature available in fashion history including fashion theory and factors influencing fashion, helped me to understand the psychology behind changing fashion, and factors influencing the same. It showed the importance of politics and technology in fashion. 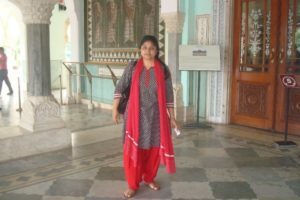 I visited museums in India and the United Kingdom. I got a chance to visit some private collectors and tailors, interacted with academics, designers, tailors and historians and tried to understand the movement of fashion, consulted many books and letters written; visited archives to look at pictures / photographs, read letters and diaries. All of them gave wonderful insight into the fashion and clothing movement of the time period. It would be difficult to thank each one of them on this blog but I am grateful to all the people whom I met during the course of my study in the UK and in India. The journey has been a very interesting one. It helped me to understand fashion movements, British-India from a clothing perspective, the influence of colonialism and finally my questions – how did the flowing garments of Indian men become so tailored. Toolika at the Albert Hall museum in Jaipur October 2014. I would like to thank the University of Glasgow for helping me with the Scotland Saltire Scholarship in 2012-13, the Karen Finch Bursary (consecutively for two years, £5000.00 each year) 2013-14 and 2014-15, and research travel awards. I would like to thank Ms Nell Hoare at the Textile Conservation Foundation for helping me with Karen Finch bursaries. I would also like to thank the Pasold Research Fund for the KG Ponting Bursary, and the Gilchrist Fund for the Field Trip Award. Many thanks are due to Dr Caroline Ness who introduced me to the KG Ponting Bursary at the Fashion Museum of Bath and advised me to look at the collection there. My sincerest thanks are also due to the Centre for Textile Research (CTR) at Copenhagen, and particularly to Dr Mary Louise Nosch, Dr Eva Andersson and Dr Paula at the CTR for all the support that I received as a PhD scholar attached to the CTR. The CTR’s funding for the trips to India in October 2012 so that I could visit various museums and exchange knowledge; to Copenhagen in 2013; to Jordan in March 2014 to present my paper at the ‘Traditional Textile Conference’; and to Warwick in November 2014 were most valuable. After the completion of my PhD, I have involved myself in some projects. These days I am helping with the Maharaja’s New Clothes and the Indian summer section of the exhibition to be held at Alford Manor House, Lincolnshire. The details can be found at https://aboutalford.com/about-higgins-india/the-maharajas-new-clothes/. The exhibition will open in April 2017. I am the ambassador for the Costume society of UK for the years 2016 and 2017. I am back in India and I teach fashion history at the National Institute of Fashion Technology, New Delhi and the National Institute of Design, Gandhinagar, as a guest faculty. Along with 12 other textile enthusiasts, I have worked towards the formation of a Textile and Clothing Research Center – TCRC in New Delhi, India. It was recently launched in New Delhi – http://costumetextileandfashion.blogspot.in/2017/02/the-inauguration-of-textiles-and.html. I am really grateful to the CTC and the University of Glasgow for giving me a wonderful environment for research, I have learnt a lot in the various workshops held at the university. I feel happy and proud to be an alumna! 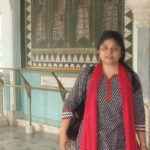 We are delighted to learn that Toolika is taking up the post of Director of the Indian Institute of Craft and Design in Jaipur this month, and wish her good luck in her new post. 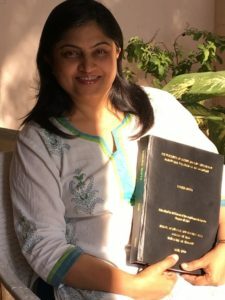 Faculty at dept of Fabric and Apparel Science, Lady Irwin College wishes best and congratulates Toolika for joining as Director of IICD, Jaipur. Very inspiring ! IICD looks forward to the new enthusiastic Director ! Welcome to IICD ….. A unique Design Institute focused towards developing catalysts for the craft sector. Thank you Simmi Ma’am! Thank you Meenakshiji!